Even if you've been sitting in the same seats with tickets to watch Michigan football for several years, our Michigan Stadium seating chart can come in handy. Wondering where your friends new seats are? 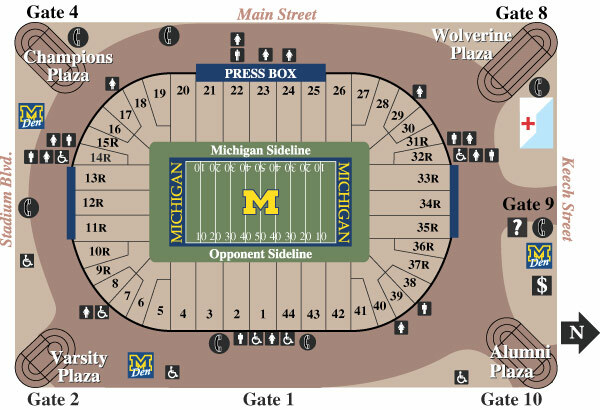 Just check out our Michigan football seating chart with a map of Michigan Stadium. Michigan Football Tix are our specialty. The gates of Michigan Stadium usually open two hours before kick-off. Make sure you've got all your ducks in a row when you get to the stadium because exit and re-entry into the stadium is not permitted. Wolverine football tickets cannot be refunded or replaced if lost, stolen, or destroyed. Children of all ages must have Michigan football tickets for admission. And finally, you should make sure you hold on to your Michigan football ticket stub at all times.